Back in January in covering some neat home automation technology at CES, I talked briefly about Nest and Google’s recent acquisition of the company. The full infographic, with a great accompanying article describing various other technologies Google has acquired or is working on, can be found at forrent.com with some of the key points provided by Brandy summarized below. 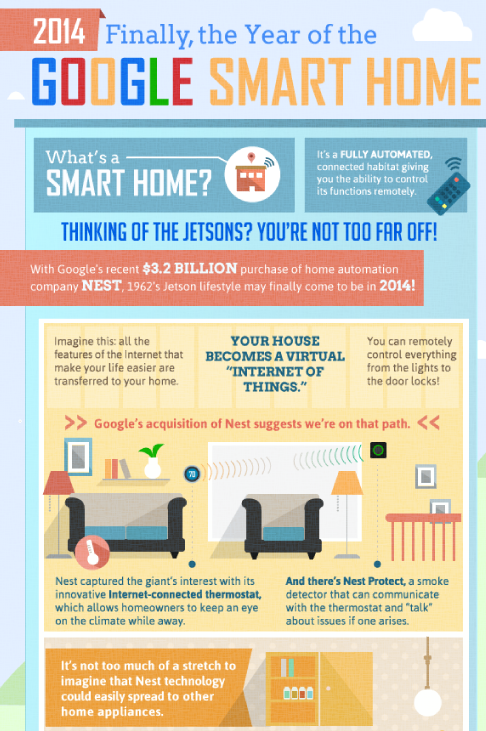 Google’s acquisition of Nest suggests we’re on the path to the 1962 Jetson lifestyle of complete home automation. Nest’s innovative internet-connected thermostat and Nest Protect talking smoke detectors may mean that Nest technology could spread to other household appliances in the near future – what if we’re on our way to a refrigerator who suggests recipes and tracks grocer lists? Kinect technology allows you to use hand gestures to control your streaming media… what if the same technology could be used to open the drapes or turn on the coffee pot – with just a wave of your hand?